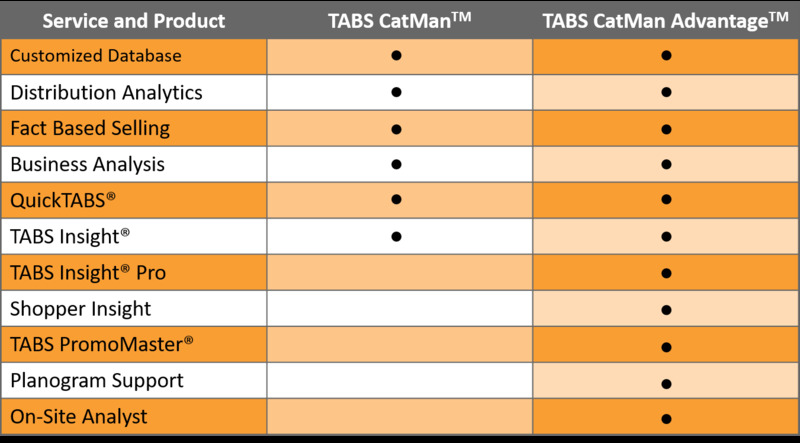 TABS CatMan is a suite of services that support your CPG Category Management initiatives. Category Management has become a catch all term for almost all Sales and Marketing analytics. It’s a function that is critical to a company’s success. Whether it is a category review for retailers, market analysis, or fact-based selling presentations, securing a competitive advantage depends upon how well your company performs this function. Database Customization and Harmonization: Great analytics start with data customization. The database must be segmented to align with how the Retail Buyers view the category and how the consumers purchase the category. TABS has re-engineered the process so it takes only weeks to implement. If you do not have data, we know what data you need, and we will take the lead in securing a cost-effective package of syndicated retail sales data. QuickTABS® Software: A user-friendly, Microsoft Excel®-based analytics and reporting tool that provides instantaneous access of your data to all members of your organization. The tool does not require expertise, online access, IT support, or additional money for seat licenses. It is simple to use, portable, and unbreakable! 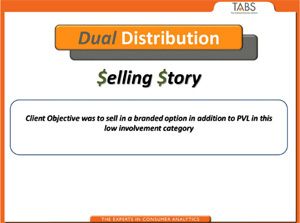 Fact-based Selling: TABS consultants have developed presentations for all US retailers as well as dozens globally. We know what fact-based information is important to, and resonates with, buyers. Our proprietary metrics, such as Sales Productivity and Organic Growth, sets your company above the competition. Business Analysis: Whether you need a market analysis, an accurate new item forecast, or a SKU rationalization study, TABS ensures you understand the current state of your business and possessthe most accurate predictions of future trends. TABS Insight™: A Web-enabled management dashboard that provides a top-line overview of your business while still allowing you to drill down into the major drivers of your business. TABS Insight helps you spot emerging trends, make improvements well ahead of your competitors, and points you in the right direction in terms of deeper for causal factors. If you’re looking to improve your Category Management capabilities, TABS can have a “Best in Class” category management department up and running in 2 weeks! A strong Category Management capability translates into strong gains in distribution, favorable pricing at retail, significant preference in promotional support, and advantageous shelf placement. TABS’ proprietary distribution based analytics and software solutions will give you an advantage over your competitors – even large CPG companies – at a fraction of the cost. Some companies prefer starting with a specific project – usually a major new business presentation at retail – at a cost of $7,500-$15,000. TABS can then migrate to a monthly retainer relationship that fits within a company’s budget and category management needs.